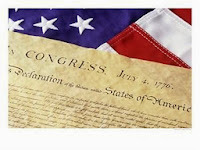 Today commemorates the signing of the Declaration of Independence on July 4, 1776. Thank you John Hancock, John Adams, Benjamin Franklin, Thomas Jefferson, and so many others for your perseverance and love for our country, and for fighting for our US Independence from British rule! Even though I haven't seen it in probably 15 years, I used to watch the 1972 musical "1776" with my family every year on the 4th. Now that I'm older, instead I celebrate the 4th by remembering (our forefathers, signers of the Declaration of Independence, and those who fought in the Revolutionary War) and also just being thankful for the freedoms that we have because of the many individuals who have stood up for them. Our United States freedom did not come easily back in the 1700s - and we will continually be fighting to preserve many of the freedoms that we have today. Instead of lighting off the traditional fireworks or sparklers, I'd personally like to make my 4th a range day and fire off some shots to celebrate. How do you celebrate the 4th? 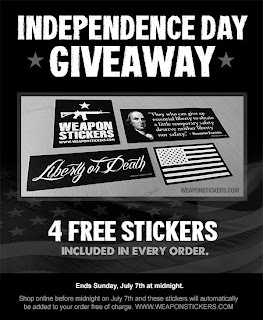 Speaking of freedom, firearms, and our forefathers, www.WeaponStickers.com, (my favorite sticker site!) is having an Independence Day Giveaway ~ Shop online on their site before Midnight on July 7th and get 4 free stickers added to your order! If you haven't been to their site before, I think you'll be pleasantly surprised. And if you have been to their site before, now's a great time to make a return visit :) Happy 4th to you all! You know you really get a prospective of how Wee you are when you see shotgun shells on your belt and they look like 40mm grenades.... ;o) Happy 4th to you and yours. Im originally from Scotland, although I've been here 10 years now, and love it. The 4th is a new concept to me, but the values are values I share and respect. I can't believe so many here want to model the USA on other countries when people like me who were born and lived in other countries come here and love the American way of life. Peter - Someone told me that in England you can be arrested just for having a screwdriver in your pocket (because you could hurt someone with that...). Not sure if that is entirely accurate but I get the idea and am happy to be here! As for Scotland, I'd LOVE to see it but probably never will. It looks absolutely gorgeous. I think you would love Scotland, I have seen you like the outdoors, walking, camping and hiking all great in Scotland, as long as you don't mind rain. But the scenery and countryside are spectacular. If you do hill walking and get to certain elevations you can see for miles over mountains, loch's and Forests. Plus the pubs are great and fish and chips rocks. Charlene - Awesome! Happy 4th! Steve - That's so great. Thank you!